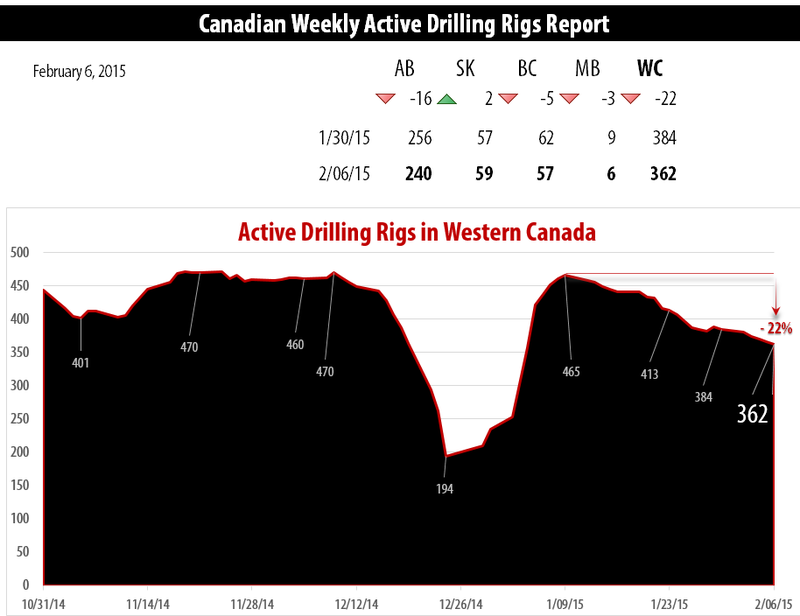 CALGARY, Alberta (February 6, 2015) – RigER presents weekly Drilling Rigs Activity Report. 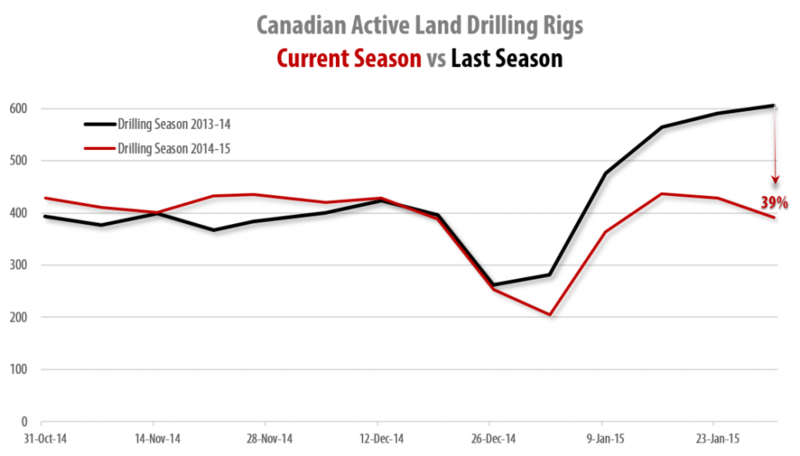 Today riglocator.ca reports 362 active drilling rigs in Western Canada (22% declining since Jan 9, 2015). 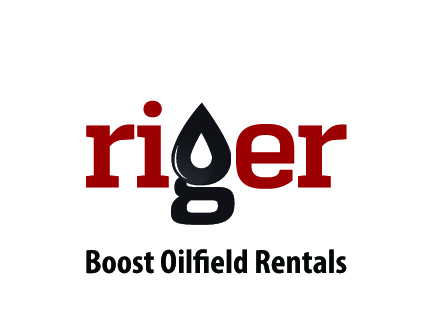 Calgary drilling companies are parking rigs and laying off crews at a much faster and deeper pace than in the last oil price crisis of 2008-09, oilfield analysts say, noting current rig counts suggest the winter drilling peak is already behind us. 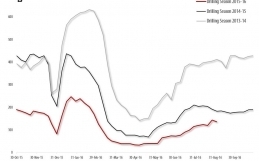 The Canadian Association of Oilwell Drilling Contractors calculates that 335 drilling rigs were working this week, down 40 per cent from 559 at this time last year. Using its measure of 135 direct or indirect jobs generated per rig, that difference translates to more than 30,000 fewer jobs. Drilling and other oilfield activity in Canada is highly seasonal because bans designed to protect country roads prevent the transportation of heavy equipment during the spring melt. Winter is normally the peak season for service companies but analysts said the early slowdown means they will likely report much weaker results than normal when first quarter financial reports are published starting in April. The CAODC said its drilling rig utilization rate fell to 42 per cent this week as only 335 of 804 available drilling rigs were at work. 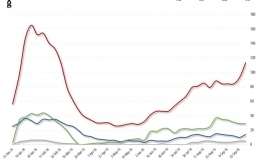 In Alberta, the number of working rigs over the past three weeks has fallen from 290 to 284 to 242 this week. 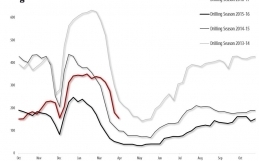 Three industry associations have predicted Canadian well counts will fall by about a third in 2015. 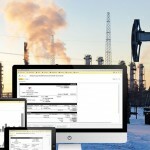 The Petroleum Services Association of Canada has forecast 7,650 new wells, the Canadian Association of Petroleum Producers expects 7,350 wells and CAODC’s number is 6,612 wells. 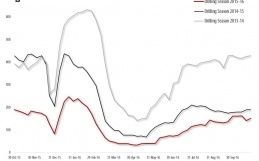 Baker Hughes Rotary Rig Count reports that Total Canadian Rig Count is down 13 rigs from last week to 381, with oil rigs down 16 to 184, and gas rigs up 3 to 197. 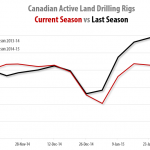 Drilling activity 39% declining since last year.